Your family's schedule fills up fast, particularly when doctor’s appointments come into play. General and cosmetic dentist Michael Moawad, DMD, at Dental Arts of Edgewater in Edgewater, New Jersey, knows that family dental health is essential. That's why Dr. Moawad is committed to serving families at all levels of dental care. 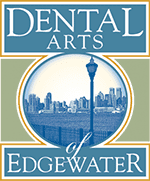 Dental Arts of Edgewater can provide dental services for your entire family. Call or book an appointment online today. At Dental Arts of Edgewater, Dr. Moawad and his staff care about your family’s individual needs. They know stress-free dental care is important to you and your family, and they’ll work with you to provide just that. Your family’s ages might range from young to old, but Dr. Moawad can cover dental health concerns for everyone. He has you covered at all stages of dental development. Why is it so important for kids to visit the dentist? The sooner your children start seeing a dentist, the healthier their mouths will be throughout their lives. The American Dental Association and the American Academy of Pediatrics recommend your child get a dental checkup by age one, or once their first tooth comes in. Dr. Moawad knows that exceptional oral health starts early. That’s why Dental Arts of Edgewater works hard to ensure your child feels comfortable and safe in a friendly atmosphere. The warmth and kindness of Dr. Moawad — which so many other patients have come to know well — will create an enjoyable, relaxing experience for your child and encourage good dental health as they develop. An orthodontist knows how to improve your bite by straightening crooked teeth and correcting a misaligned jaw. Orthodontic concerns need to be addressed during childhood or adolescence to achieve the best results. If you wait too long, optimal results may not be possible because your child’s face and jaws have finished growing. In addition to general family dentistry, Dr. Moawad offers orthodontic services like Invisalign and oral surgery to correct any problems with your child or teenager’s teeth. Dental Arts of Edgewater makes a point to make dental appointments work around your family’s schedule. You need an experienced general dentist who can care for your whole family, so call Dental Arts of Edgewater or book an appointment online today.